Enhancing a bought stock with other flavours is an easy way of ensuring your risotto will taste great. For the stock, place the vegetable stock in a large pan with the garlic, saffron, white wine and tomato purée. Bring it to the boil, then simmer for 5-10 minutes. Meanwhile, cut the squash into 1cm dice, then add to the stock. Continue to simmer the stock for about 10 minutes until the squash is just tender. Using a slotted spoon, transfer the squash to a plate and set aside. Then remove and discard the garlic cloves. To make the risotto, melt half the butter in a heavy-based pan, add the rice and stir it well with a wooden spoon on a low heat for 1 minute. Gradually ladle in the hot stock a little at a time, stirring constantly and ensuring that each addition has been fully absorbed by the rice before adding another ladleful. 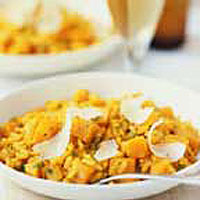 When the rice is just tender, about 15-20 minutes, stir in the cooked squash. Keep adding the remaining stock for about 5 minutes, or until the rice is creamy and the stock is absorbed. Stir in the chopped parsley, Parmigiano-Reggiano and the rest of the butter. Season and serve topped with cheese shavings. If you prefer a more intensely flavoured stock, reduce it further over a high heat for an extra 5-10 minutes before adding it to the rice. Keep it hot until you make the risotto or, if you are making the stock in advance, reheat when needed.